Just in time for spring comes a refreshing and alive exhibition—one that has been months in the making. Trent Call and Dan Christofferson at Kayo Gallery this month truly bloom with a vibrant evolution—paintings with an old-timey class and a pop-culture flare. This is new work, not only in its chronology, but also in its approach. For Call, it shows a significant departure from his work of seasons prior. More muted, abstracted, gestural figures emerge from a painterly background. Smaller in format and more intimate because of it, his works are subtle—but still true to his loud, bright, animated works. The large triptych in his vintage style almost seems like the odd man out in this new portfolio. 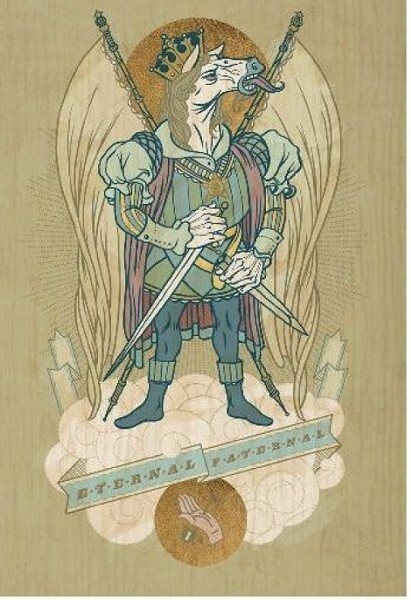 Dan Christofferson, also a very illustrative artist, exercises a discerning use of exposed wood grain in his altar-like panels (detail of “Eternal Paternal” pictured above). These pieces, too, are different from a previous body of work. Highly stylized and paying homage to the Bay Area’s visual language, his works—regally backed by fabric hanging from the corners—are dialed-in surrealist calligraphic doodles that hint at an underlying narrative. Immaculately executed, the paintings—which really seem more like drawings—reveal lonely, comical figures. Adorned with words like “freedom,” “beauty,” “health” and “wisdom,” they seem vaguely like emblematic advertisements obscured by uncertainty, as the words are written in German. High-art and bluecollar all at once, clean-lined, fun works are a break from the norm.